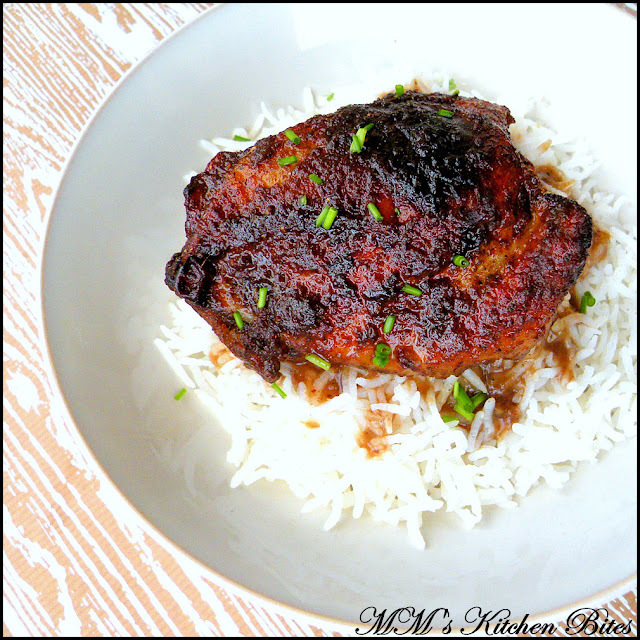 MM's Kitchen Bites: Chinese 5 Spice Chicken with Soy and Honey...cluck cluck!! Chinese 5 Spice Chicken with Soy and Honey...cluck cluck!! Whisk together all the marinade ingredients in a large flat dish. Add the chicken pieces to the marinade and mix well to coat. Cover the dish and let it rest in the refrigerator for a minimum of 2-3 hours or up to overnight. Bring the chicken back to room temperature and preheat the oven to 180 degrees C.
Lightly grease the baking rack with place it on a foil covered baking dish. Arrange the chicken pieces in a single layer on the rack. 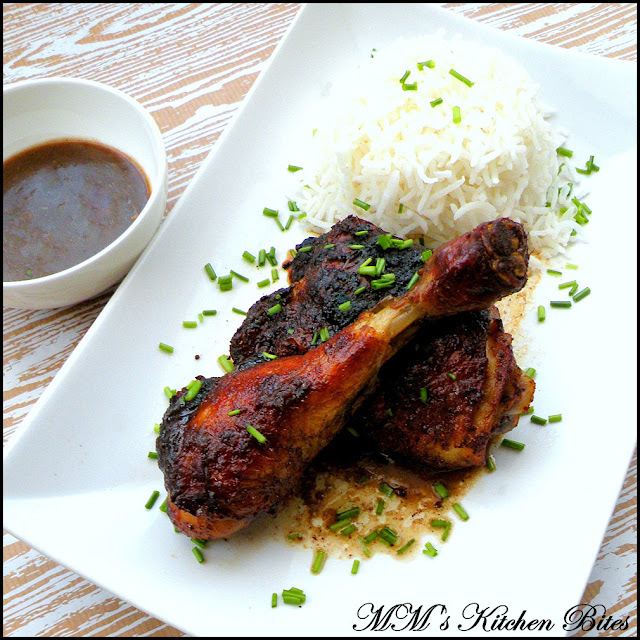 Cook uncovered, basting once or twice with the marinade, until the chicken is done, about 50 minutes with last 10 minutes at 200 degrees C.
If you want a little sauce to go along with rice, place the chicken with the marinade and 1 tsp of oil mixed in in a baking dish. Cover the dish with foil and bake for 40 minutes and then uncovered for the last 15-20 minutes at 200 degrees C.
The juices from the chicken along with the marinade will give you just about enough sauce to drizzle over the rice. Chinese 5 spice powder is readily available in markets and is normally a blend of equal quantities of ground cinnamon, ground cloves, ground star anise , roasted and ground fennel seeds and roasted and ground Szechuan peppercorns. Some blends may also contain nutmeg and ginger. The glaze on that chicken looks amazing. And I love Asian flavours in the oven. I find they often turn out so much more tender than a stir fry. Buttermilk Blueberry Muffins...the day after! !